While some enjoy the task of cleaning, most people are looking for the quickest and easiest way to get the job done. Cleaning, by definition, is a chore. But that doesn’t mean it has to be hard. To make the task at hand more manageable, you will need a few simple tools that can picked up from your local dollar store. Combine those bargain items with some healthy & high-quality products (and a little time), and you are on your way to tackling dirt and germs. 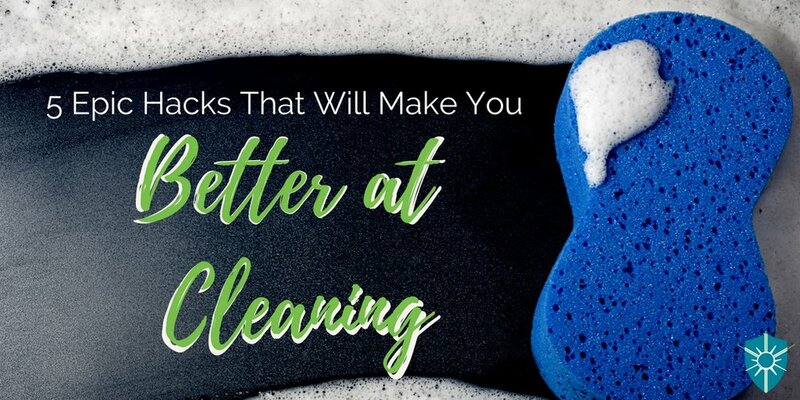 Here are 5 epic cleaning hacks that will help you to clean better, without turning your home into a toxic landmine. Window Blinds are perfect for providing privacy…and for collecting dust. These convenient household staples are easy to use, but hard to clean! To make that job a little easier, consider outfitting a standard pair of kitchen tongs with microfiber clothes, to make the perfect bling-cleaning tool. Any pair of tongs will do, but the kind with plastic tips will help to keep your cloth in place. Using rubber bands to secure, roll a microfiber cloth to each side of the tongs. When ready to use, simple slide you tongs over the horizontal strip of blind, squeeze, and run it back and forth. Voila! Dust-free blinds. Legos, action figures, pretend food…you know…all those tiny pieces of childhood toy culture that never get cleaned. Well, getting those items sanitized has never been easier. Simply put those water-safe items in the dishwasher, and run as usual. They be cleaned and steamed! If you are concerned about small pieces falling down into your dishwasher, simply slide them into a zippered mesh bag (the kind sold for washing intimate apparel). After getting the toys squeaky clean be sure to spray them all down with MonoFoil to create an antimicrobial layer that will keep your little people protected for longer! Make clean-up a snap when you have your items pre-gathered and living in their cleaning destination. Nothing is more aggravating than needing to clean the bathroom, but then having to go hunting for supplies (only to discover that your husband has swiped the scrub brush for the tub to clean the tires on his car). A few simple chore kits can help to eliminate this headache. Decide how many cleaning kits you need (one per bathroom, one for bedroom cleaning/dusting, one for the kitchen, etc. ), and purchase a plastic basket for each location. Fill each basket with the appropriate cleaning materials. You can buy small sponges, microfiber cloths, dish soap, gloves (so you don’t mess up your manicure cleaning up greasy messes), etc. at the dollar store. This is the perfect opportunity to try the MonoFoil D- Daily Disinfectant! With this amazing antimicrobial shield that is non-toxic, you can clean and protect your home and the people that live in it. Also, consider keeping a roll of paper towels with each kit. When you have your kit complete, store under the bathroom sink or in a hall closet for easy access. Want to take your kit to the next level, attach a supply list and chore chart to each basket! Ewwww. Grossssss. Most microwave are neglected until it is embarrassing. Spaghetti sauce is splattered on the walls, and popcorn kernels roll around in the bottom. The struggle is real! But it doesn’t have to be your reality. Cleaning that microwave is easier than you thought! Remove the microwave tray, and set aside. 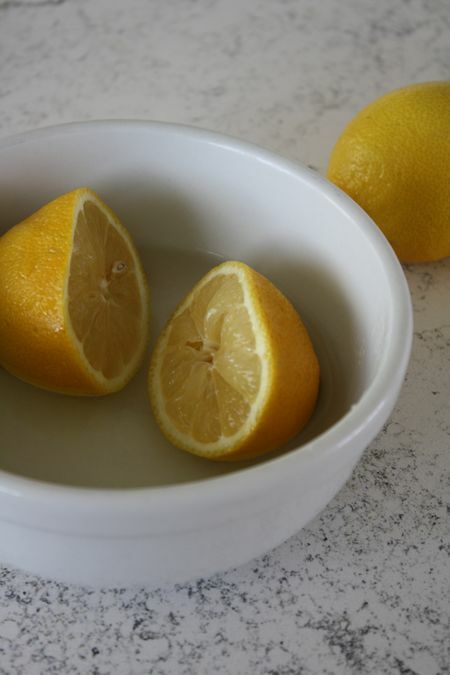 Slice a fresh lemon in half, and squeeze it into a microwave safe bowl filled with about 1 cup of water (put the lemon in the bowl after the squeeze). Microwave the lemon bowl on high for 4-5 minutes. Then, allow the lemony steam to work its magic for 10 minutes (do not open the microwave door). While you are waiting, wash the tray in hot soapy water. When the 10 minutes is up, remove the bowl and wipe down the microwave walls with a clean cloth. Now your microwave is sparkling and citrusy clean! Do you have pets? Then more than likely, you battle with pet hair. Well, here is a simple tip to easily remove pet hair from cloth surfaces. Put on a rubber dishwashing glove, get it damp, and wipe the areas that need attention. The rubber glove will grab the pet hair, much like a lint roller. When your glove needs cleaning off, simply wipe off with a paper towel. You could also rinse the glove under running water…with a sink strainer in place. Your pillows and couch will thank you! As a final step be sure to spray your couch with MonoFoil to keep any funky odors at bay, and get rid of bacteria!! Share them on social media!